I paid several hundred dollars to interview at FlyDubai in Miami. Only several weeks went by from application to hearing from FZ for the interview. 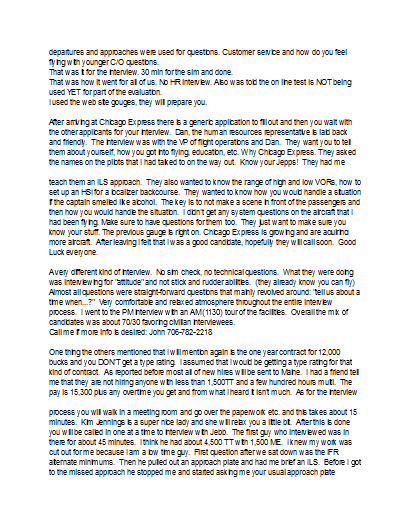 The interview was to be two days at PanAm Flight Training in Miami. I recommend using the PanAm corporate rate at one of the nearby hotels. The interview was conducted by CTC. 10 of us gathered in the waiting room before the scheduled interview time. The interview started with a presentation by the CTC rep and the FlyDubai recruiters. We were given information about what to expect in the interview. This included that we were not competing against each other, but against FlyDubai’s standard. We were presented the compensation package and information about moving to Dubai. After the presentation we were split into two groups and took a short break. One group was to take the cognitive test while the other group did a group exercise. The cognitive test consists of a joystick type game where you are multitasking while holding two lines over a localizer/glideslope T. I don’t think there is any way to prepare for this, because even if you had the exact test your joystick may not be as sensitive or not sensitive as the one you use that day. Additionally, the gouge I read said we would get to do each “game” 3 times, but that was not the case. There were 3-4 games that we did each time and they got progressively more difficult. The CTC representative even tells you before the test that the game will beat you, and that you should not be upset if you feel you did poorly. I just decided to have fun and hope for the best. After the test, which some people were distraught about, our group waited for over an hour before the group exercise began.